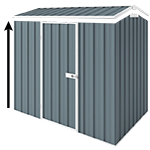 Welcome to Cheap Sheds, on this video we’ll show you how to assemble the YardSaver Flooring Kit for our all time best seller the Cheap Sheds 2.8m x 1.07m slim line garden shed. After opening your box, start sorting out the pieces by referring to your instruction. All parts are labeled for easy identification. Depending on the size of your shed, you may not need all the parts included in the kit as the flooring kits are designed to fit a range of sizes. For this size Cheap Sheds we’re using the medium kit and do have some leftover ... surely enough to make an awesome workbench out of it. Next step is to measure all the pieces you need to cut ... frequently checking the supplied instructions. Not every size flooring kit needs cutting, but some do. Mark the exact measurements required and ensure they are visible on all sides. Easiest and safest is to use a pair of metal cutting shears for cutting the pieces to the required length. Then simply blend the metal outwards a few times to break it. Next, measure the length for the pieces that need to be joined together. Mark the point where the pieces need to be joined together and then copy it over to the piece for the other side of the frame. Then join the pieces together. The trick here is to try not to put them over the line as it is really hard to knock them out, while it is a lot easier to knock them down. Then use your measuring tape while adjusting to the required length. Then push and hammer the pieces together before securing them with 3 screws as you can see them here. Then start putting the frame together starting in one corner. Refer to your manual and ensure that you Channel B is inside Channel A and to maintain a gap of 6mm at the corner as we’ll show you in a moment. Use a bite grip to hold the pieces together while driving the screws in to ensure the screws end up where you intended them to be. Move onto the next corner and repeat the same process ... Here you have a better view of the 6 mm distance from the corner that I referred to a moment ago. Make sure you diagonals are equal and cross check all other dimensions throughout your progress with fixing the corners. We suggest you use a piece from the kit as a temporary brace to hold the frame square while you are working on the middle pieces of the flooring kit. The next step is to measure where the Channel C’s go. Easiest way to calculate where the middle Channel C should go and measure that from both ends ... you may end up with 2 lines very close to each other, then just mark the middle as you see on the screen and that will be where your middle Channel C will go, easy as that. Then secure the middle Channel C.
Next step is to measure the spot for the other 2 Channels C’s and secure them with screws. The turn the frame around and drive in the required screws on this side as well. That completes the installation of your frame and we recommend purchasing plywood to cover the flooring kit. You can get your local hardware store to cut to size for you. So here we add the plywood ... be careful not to go too close to the edges of the plywood. Your flooring should be square and to ensure the best support for your shed please make sure it is placed on a level surface.